Please note there is $20.00 shipping for the case for this set. 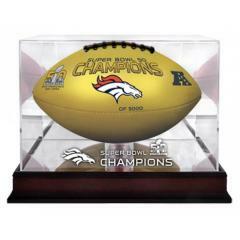 As a special item for Broncos fans, we are pleased to offer this unique Broncos Super Bowl 50 Champions Gold Ball with a Custom Display Case. This rare football is available ONLY from BigTimeFootballs.com! 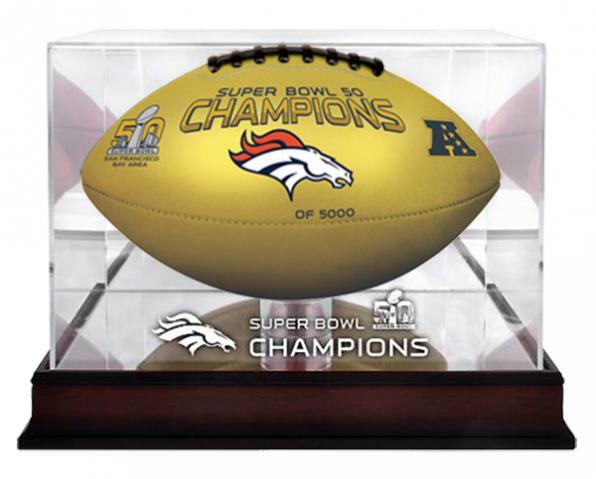 This rare collectible is an all-gold panel ball fully licensed and embossed with both the Broncos team logo, the Super Bowl 50 logo and the Super Bowl Champions inscription. Each case is laser etched with the Broncos logo and Super Bowl Champions inscription. You will not find this rare Super Bowl Championship commemorative football anywhere else. Order yours today. Due to the limited nature of this offer we must charge your credit card for the full amount immediately upon taking your order. This policy ensures we reserve a ball for you. We will confirm your order by Email. This ball is not game used. Please allow 8 weeks for delivery. Please not the shipping charge is for the case only, there is no shipping charge for the football.